Every Leader deserves training to be able to successfully deliver the Scouting program! Cub Scout Leaders can wear the Trained patch when they have completed Youth Protection and Cub Scout Leader Specific training for their position. Scoutmasters and Assistant Scoutmasters can wear the Trained patch when they have completed Youth Protection, Scoutmaster Specific Training, and Introduction to Outdoor Leader Skills. Pack or Troop Committee Members can wear the Trained patch when they have completed Youth Protection and Committee Specific Training. Training of adults to successfully deliver the Scouting program has evolved into a well-presented, thorough curriculum of courses to be completed in sequence. Problems with your My.Scouting account can be resolved by contacting the Member Care Contact Center at (972) 580-2489 between 5 am – 5 pm Pacific time, Monday through Friday, or by sending an email to myscouting@scouting.org. One of the best parts of MyScouting Tools is that it is tied to your membership account IF your member number is correctly linked. When courses are completed, training records are automatically updated. Creating a MyScouting Tools account is simple. 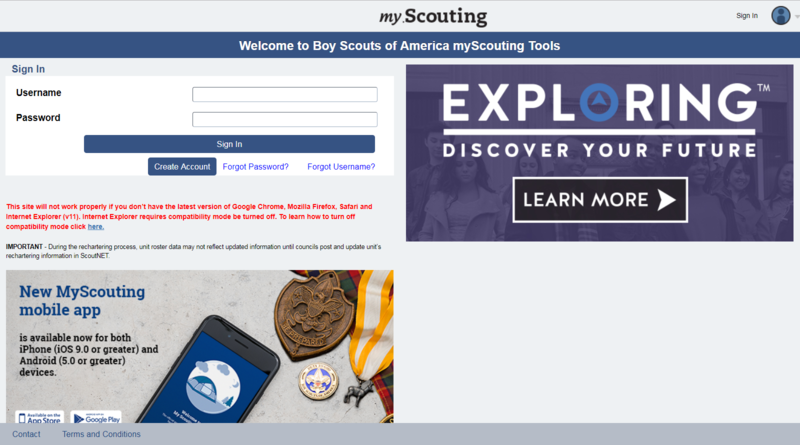 Go to http://my.scouting.org and select "Create Account." PLEASE NOTE: If you have forgotten your Username and/or Password, please select "Forgot Username?" or "Forgot Password." Do NOT create a duplicate account as this confuses the system. If you have been registered in another council or need to update your member number, please read this guide. If you have been involved with Scouting in any aspect in the past, which includes filling out an application with your name on it (even as an adult partner), the system will find you if you answer “yes” to being associated with Boy Scouts of America. This helps keep all your information under one BSA number. If you don’t know your BSA number, answer “no,” and the system will find it for you. Fill in the personal information, select "Next," and create your password. You will need to log in again sometime in the future, so be sure to remember your username and password. Youth Protection training is designed to help you keep our youth safe from abuse. You will learn the Boy Scouts of America's Youth Protection Guidelines, signs of abuse, and how to report suspected abuse. After each section of material, you will answer questions about that section's topic. Completion is noted automatically in the BSA training records database if the module is experienced online, and the account is properly linked to your member number. Every Leader deserves training to be able to successfully deliver the scouting program! Cub Scout Leaders can wear the Trained patch when they have completed Youth Protection and Cub Scout Leader Specific training for their position. Scoutmasters and Assistant Scoutmasters can wear the Trained patch when they have completed Youth Protection, Scoutmaster Specific Training, and Introduction to Outdoor Leader Skills. Pack or Troop Committee Members can wear the Trained patch when they have completed Youth Protection and Committee Specific Training. Specialized training is available for all positions in Scouting.